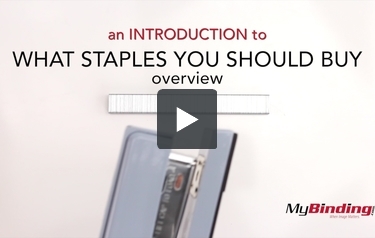 Top-quality, heavy-duty staples provide clean, consistent stapling you can rely on. Sharp chisel points allow easy penetration and reduce jamming. Finally I found the right sized staple for 1950/1960 style Seingline staple gun! Ordering was easy. Delivery was fast Product worked great in a stapler that is over 55 years old. Couldn't find either of these 3 items at office depot. good price and selection. I am a first time buyer and will certainly consult this website for other items. These are hard to find items, so when I was about to give up I found MyBinding.com. The website is great, the items are exactly as shown and the prices and service are terrific.I will come back whenever I need supplies. My stapler uses Swingline 808-1/2. Where do I find them? Thank you for your question. Speaking with the manufacturer they recommend product SWI-79392 as they are a heavy duty 1/2" staple. Asked by Waldon Rogers Jr.
Th Desa swingline stapler has been discontinued. I did contact the manufacturer and they said you could still order staples from a company called SUREBONDER.COM or you could call them at 800-860-3838. Good luck! I have a Swingline Powergun1000: On it is lists Staples: 1000-4-1/4 1000-5-5/16 1000-6-3/8 1000-8-1/2 1000-9-9/16 what Staples should I buy? Thank you for your question. We reached out to Swingline and unfortunately they no longer make staples for the Powergun line of staples. I need staples for a Swingline #101 Tacker. Where can I find them? I need Swingline #13 high carbon staples 1/4". Where can I purchase them? Our Heavy Duty staples are the updated version of our S.F. 13 staples. The item number for the 1/4" leg length is #S7079394. I need staples for my OLD model 34302 Electric staplers. Where can I find staples to fit it? We no longer produce the Electric Staple Gun #34302. There appear to be some 3rd party staples available to fit that model if you search online, but we cannot guarantee the effectiveness of any non-Swingline items. We no longer produce the Staple Gun #10060. There appear to be some 3rd party staples available to fit that model if you search online, but we cannot guarantee the effectiveness of any non-Swingline items. which staples are compatable with swingline 181 tacker? We no longer sell this product but we would recommend our SF4 Heavy Duty staples. We no longer manufacture the SF 13 staples (old heavy duty staples). You can view our current heavy duty staples on www.swingline.com though. Need staples for electric staple gun 32001. We do not make any staples specific to an electric staple gun as we do not manufacture that product. You can use any of the S70353XX (suffix depending on staple leg size) Heavy Duty staples that can be found on www.swingline.com. What kind of staples do I need for stapler #39005? Swingline® Premium Heavy Duty Staples with 1/2" leg length (S7035312) will allow you to staple between 40-90 sheets using your Swingline Heavy Duty Stapler. Is it still possible to find Staples for #35550 Stapler. The full item number for 35550 staples is S7035550 - Swingline® Optima® High Capacity Staples. My Swingline stapler uses:1/4"LEG No.101-4 & 5/16"LEG No. 101-5 staples. I have been unable to find staples. Any suggestions? Swingline recommend part number S7035314 They are available to us in the UK, via Amazon but shipped from a company in New York!! Happy hunting. The width is a bit over 0.39inches or 1cm. Do you still sell S7035314 staples for the Swingline 101 Tacker? We no longer sell the Swingline 101 Tacker and the staples that go along with it. You may be able to find the staples on another online e-tail website. I need staples that will work in a Swingline heavy duty staper model # 77701/15, on the bottom it says to use only #35550 staples. Do you have them? Yes, we do offer the #35550 staples. Visit the Stapling Accessories page of the Swingline website or search item #S7035550. I have an electric Swingline Model # 34201 staple gun, what size stables does it use and where can I purchase them? We have not sold this model or any staple gun style stapler for quite some time so unfortunately I can't provide you a recommended staple replacement. Another alternative is to take the staple gun into your local hardware store to find the best staple fit. We do not carry the staples for the 800 series anymore. However, you can buy them at www.surebonder.com. Do you still have Premium Heavy Duty staples with 5/8" leg? Unfortunately, a 5/8” staple is not offered for the Heavy Duty 160 sheet capacity stapler. As you found, only ¼”, 3/8”, ½”, and ¾” are available for that stapler.